Oscar Coen had a long and distinguished flying career that continued after the end of the Second World War. “Oscar Coen was born in Wallum, North Dakota on 11 May 1917. He spent his boyhood on a Wisconsin dairy farm. He graduated from the University of Wisconsin at Madison with a bachelor of science degree. He had become a school teacher in Marion, Illinois, but he decided he wanted to fly, and in May 1940 he enrolled as a U.S. Army Aviation Cadet. He soon discovered that he was to become a Navigator and resigned in September 1940, and later joined the Royal Canadian Air Force (RCAF). After completing his RCAF training and his Operational Training Unit programme in England he was assigned to No. 71 Eagle Squadron, RAF, flying Hurricanes. These were soon replaced with Spitfires armed with cannons. On 20 October 1941 Oscar was strafing a train which blew up under him and he was forced to bail out over French occupied territory. With the help of the French Underground, he was able to avoid capture and escape through Southern France and Spain to Gibraltar. He returned to his squadron on Christmas Day 1941. Back on Ops, on 27 April 1942 Coen with Mike McPharlin succeeded in downing three Fw-190s. On 19 august 1942 the two again collaborated in downing a Ju-88 and a “probable”, andanother Fw-190, while helping to maintain air superiority over “Operation Jubilee”, the code name for the unsuccessful Dieppe landing. Unfortunately, McPharlin had to bail out over the English Channel, but he was rescued and returned to base. On 15 September 1942 Coen transferred to the U.S. Army Air Corps as a Captain and was subsequently introduced to the P-47 Thunderbolt. The transition was not easy, to say the least. The “Jug” (as the P-47 was known) weighed in at seven tons, compared to a Spitfire at half that weight. Being a new design, the P-47s had many problems that required ironing out. It did not pull out of a dive as Nimbly as a Spit’, which caused a couple of pilots to crash. At high altitude engines could blow up of freeze, and it was difficult for pilots to exit the plane in an emergency. Nevertheless, in that aircraft he became an Ace, downing his sixth enemy aircraft with three probables. Oscar had a catastrophe; while flying near Alconbury in P-47C 41-6403 ’03’his engine exploded, and in bailing out at high speed he used his right arm to pull the rip cord, and the sudden force fractured and dislocated his shoulder. Fortunately, he was over England and received immediate attention and therapy that saved his arm. After two months of recuperation he was back at the group on 4 August 1943. Still unable to raise his right arm above his head, he had to modify some of his movements to comply with the demands of cockpit routine, but he managed to the extent that he was again able to lead a squadron into combat. On 11 April 1944 he was assigned to headquarters of the 8th USAAF in London. There he participated in planning fighter cover for the impending invasion of the continent. On D-Day he flew a P-47 over the landing areas to observe the results of the planning. During the war Oscar accumulated 550 combat hours on 200 missions and is credited with 5.5 enemy aircraft destroyed. He flew Hurricanes, Spitfires, Thunderbolt and Mustangs. His awards include three Silver Stars, the British Distinguished Flying Cross, the Royal Air Force Medallion, the Campaign Medal of the Battle of Britain, the Croix de Guerre, the U.S. Air Medal with three Oak Leaf Clusters, three Distinguished Flying Crosses, and campaign and service medals. Another interesting fact about Oscar is that he later married the widow of his best friend, “Wee” Mike McPharlin, and raised Mike’s daughter – who sadly never met her real father – as his own. Good on you, Oscar! 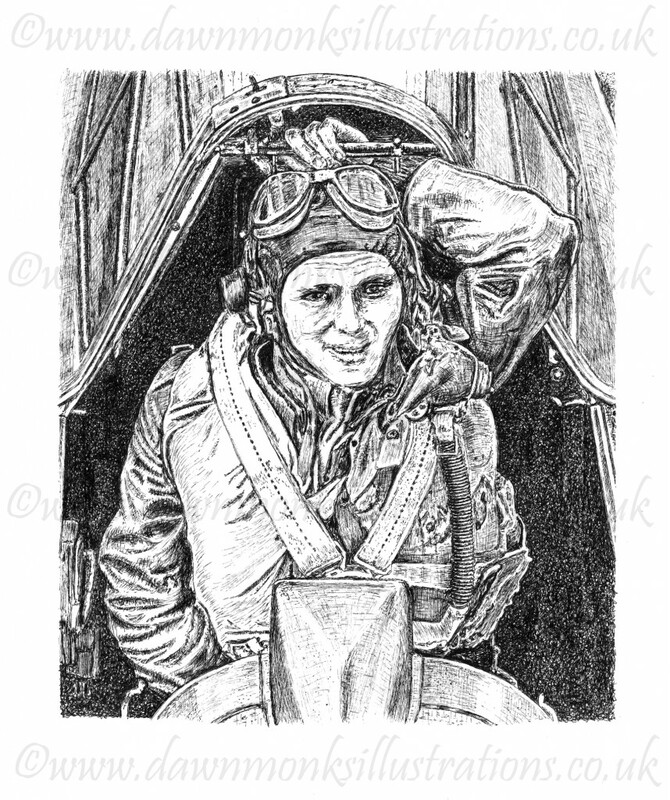 This portrait is of Oscar in the cockpit of his P-47 Thunderbolt and, as with most of my work, it is drawn in pen & ink.